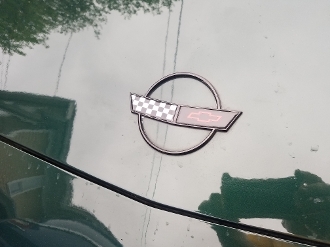 CORVETTE C4 HOOD AND FUEL DOOR EMBLEM OVERLAY 1991-1996. CHOOSE THE ORIGINAL COLOR OPTION OR YOU CAN CHOOSE CUSTOM COLORS. YOU GET 2 DECALS WITH THIS ORDER. IF YOU WANT TO CUSTOMIZE THESE AND DO NOT SEE THE OPTIONS THAT YOU WANT, JUST MESSAGE US AT VELLOSVINYL@GMAIL.COM OR TEXT 724-422-6315.